This has been the most requested dessert from my family all summer long. Everyone loves blueberries and this is the easiest no bake recipe of all. I like to sprinkle large white sugar crystals on the crust to make it extra special. Do you remember Ruth Wakefield who owned the Toll House Inn and invented the chocolate chip cookie? This is the way she did it. Slowly add the flour paste to the hot berry syrup & stir, boiling until it becomes clear and the mixture thickens. Remove from heat and let cool for 5 min. Add 3 cups berries to mixture, mix well & pour into a pre-baked pie shell. Chill 6-8 hours. 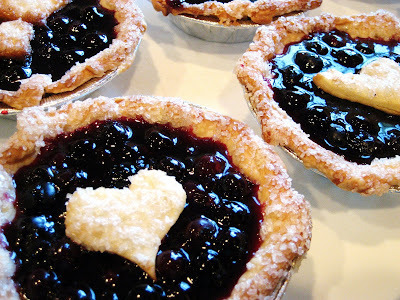 These blueberry pies are truly delicious and the perfect summer dessert. These are now one of my husband's favorite desserts - thanks Linda!